The concept of jazz-rock fusion is not exactly a new idea, yet new and exciting musicians keep stepping up to the challenges of bringing the genre just that much further. Case in point is Next Stop, the 2013 CD by The John Irvine Band. This excellent nine track Next Stop CD somehow went under the radar yet, thanks to astute listeners who continue to sing its praises the Next Stop CD finally found its way for review into the trusty mwe3 CD player. 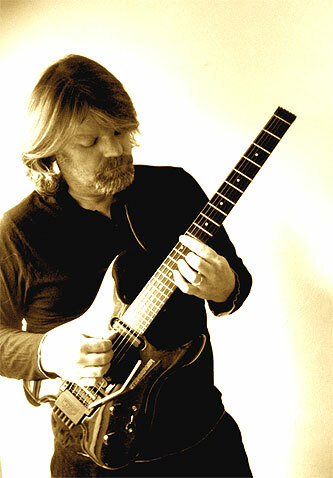 Some in the know music fans have cited the late 1970s music of Alan Holdsworth as being similar in style to the sound of Next Stop. That may be true, yet on Next Stop, the Scotland-based John Irvine just about revolutionizes the entire jazz-rock instrumental concept and overall, Next Stop makes for a most electrifying hour of music listening. Not only are Irvines guitar skills first rate but his mastery of the melodic ideas involved in creating memorable instrumental music makes Next Stop one of the most vital instrumental fusion albums of the millennium. A most successful follow up to Irvines 2011 CD Wait & See, on 2013s Next Stop, Irvine settles deeply into a vast sonic landscape while receiving fantastic support from his JIB rhythm sectionAlan Emslie (drums, percussion and co-production) and Doug Kemp (bass). 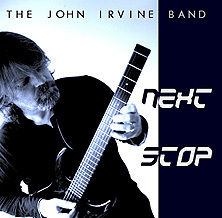 Fusion fans looking for new and intelligently written and recorded instrumental jazz-rock fusion will do the right thing by picking up on the CD release of Next Stop, by the John Irvine Band. mwe3: I was kind of kicking myself for not hearing the Next Stop CD last year. Its that good. When did you write and record Next Stop and how would you compare it with you earlier album Wait & See? John Irvine: Well, thanks Robert for the kind comments. It's great to know that the album is finding the kind of people I intended it for. And to answer the first part of your question, I composed the majority of the material for Next Stop in the two years following Wait & See. It takes me a long to time to get an album's worth of music together. My home studio set-up had changed between albums and I had some problems with gear, but those were resolved over time and the main work was done from February to June 2013. The final mixing and mastering was done at Castlesound Studios in Pencaitland, outside Edinburgh - the same place as where Wait & See was done. 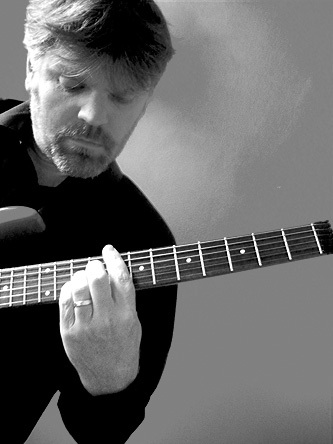 Stuart Hamilton was the engineer on both albums. He really transformed the material into what it is, sound-wise. In comparison with the first album, I think Next Stop marks a real development. I think the compositions are more complex, a bit more interesting than the material on the first album, certainly the keyboards and background layerings are richer, more intricate. And both the jazz element and the progressive element are more prominent on this one, they've both been brought out a bit more. mwe3: It seems like youve hit a veritable sweet spot on Next Stop, is that a fair statement? What was your sonic mission this time? John Irvine: Yes, I think Next Stop is the better album, overall. But if I were to be overly self-critical then I would say that there are things that I like more on the first CD. The playing on Wait & See is a bit tighter, in my view. With the last album I let a bit of the production side of things slip, because of time constraints and the fact that it was a bigger project, as a result there are several things that could have been done better. It reminds of an interview I read a long time ago with Yes drummer Alan White, where he'd criticized Trevor Rabin for going through the whole of their Talk album and moving all the drum audio so it was perfectly in time. Well, that was my approach on Wait & See, and it shows. Next Stop has more of a 'live' feel, but lots of people seem to like that, so it's all good. mwe3: Youre pictured on the cover of Next Stop playing a kind of Steinberger (headless) looking guitar. Is that the same red guitar pictured on Wait & See as well? John Irvine: The guitar on the cover of Wait & See is a Hohner headless guitar called 'The Jack' made in the 1990s - a Steinberger copy, very similar to the current G3T but with a Strat body. Very well made - and having played a good variety of Steinbergers over the years, a very versatile guitar. The guitar on the Next Stop cover is a Steinberger GR4 headless, correct. mwe3: How has your choice of guitars changed and evolved over the years and what guitars are you playing on your albums? Do you also play acoustic guitars? I find them very difficult to play, but there will definitely be some classical guitar on the next one. mwe3: Tell us what keyboards youre playing on the CD and how the keys mesh with the guitar sounds? 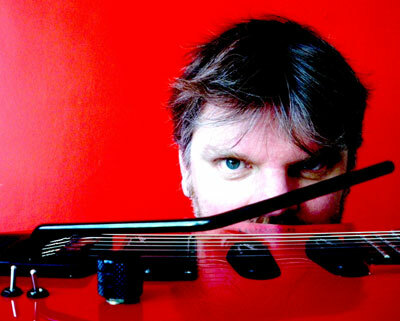 John Irvine: I use MOTU's Digital Performer in my home studio. It's a program I've used for about 25 years now, and all the keyboard sounds are virtual instruments from their 'MX4' program. Most of the keyboards are secondary in importance to the main guitar parts, but I wanted to fill out the sound a bit more on this album. mwe3: Can you tell us something about where youre from, where you grew up and where you live now as well as how you became interested in the guitar and how that interest led to you becoming a recording artist? Growing up in Southern Ontario as a teenager you couldn't help but be influenced by what 1970s FM radio was playing at the time: Steely Dan, Chicago, Doobie Brothers, Earth, Wind & Fire, Stevie Wonder etc. and by the local rock bands on the Toronto scene: Rush, FM, Max Webster, Goddo and Triumph. We were also listening to the major hard rock bands of the 70s: Kiss, Aerosmith, Queen, B.O.C., Cheap Trick, Ted Nugent, Angel and so forth. Now, a lot of that music is very sophisticated, but a friend of mine in 10th Grade told me to go away and listen to Relayer by Yes, to 'hear what real music was like'. I knew Roundabout from the radio, but hearing The Gates Of Delirium for the first time was a whole new listening experience. It was all I played for about a month, and soon, Genesis, Gentle Giant and King Crimson followed. We then moved to England. I was lucky that the public library in Plymouth had a great vinyl selection. I would take out anything that looked remotely interesting to me. So, I borrowed Stockhausen, The Manhattan Transfer, a whole bunch of ECM stuff, Bill Dixon, Ornette Coleman - it was a treasure trove. Most importantly though, was that I went to Dartington College of Arts, Devon upon leaving school at 18 years old. This was a somewhat radical, left-leaning, arts establishment where I was lucky to be taught by the composer Frank Denyer, study with the jazz guitarist John Etheridge and attend concerts by Evan Parker, Keith Rowe, Keith Tippett, Yoshikazu Iwamoto and Armanath Mishra, amongst others. I also saw Segovia play in the Great Hall, but he was already in his 90s at this point. Needless to say, this was the best education I ever had. mwe3: Who were some of your favorite bands and musicians growing up? What era of music did you grow up in? mwe3: Track four Your Skyline is a tribute to the late great John Martyn. Even though John Martyn was primarily a folk-jazz singer he must have had a big impact on you. Tell us about John Martyn and how other musicians had an impact on you. John Irvine: John Martyn was another big influence in my early 20s. I'd seen him live with his band in Plymouth in 1983 and a couple of times since then in Glasgow. His One World, Glorious Fool and Grace & Danger albums I regard as being his best work, and right up there with Joni Mitchell's Court & Spark, Hissing Of Summer Lawns and Hejira as the pinnacle of the guitar-based, singer-songwriter genre. I must also say that I regard the Michael Hedges album Watching My Life Go By in that category. But just thinking about these three guitarists and how they approach the instrument harmonically, it's interesting to note that all three used alternate tunings. Now, that's not something I go in for, but their chordal usage is certainly one that I am very keen on - particularly the Hedges vocabulary. So, certainly it was a sound that I was looking for - but in standard tuning. You can see where I'm coming from. And if you take into account the Metheny things, the Holdsworth things, add in some extended chord voicings and classical fingerstyle then you have my harmonic goals pretty well mapped out. I should mention that around this time I got heavily into the West Coast/AOR scene: Christopher Cross, Michael McDonald, Ambrosia, Al Jarreau, Toto and, of course, this music has many great, great players like Jay Graydon, Steve Gadd, Larry Carlton etc. who are all well-versed in jazz and rock styles. That music stills holds great appeal for me. It has amazing moments of jazz-influenced harmony, for example a track like Generalities by Marc Jordan. Genius. mwe3: Do you find your music being influenced by other art forms like movies, paintings, other musical genres as well? John Irvine: I find my jazz music is not influenced by other art-forms to any great extent. However, my classical music is. I've written two multidiscipline works concerning Outsider Artists. The first being a musical drama about Laure Pigeon (a French mediumistic artist), and the second, a Percussion Quartet about Kea Tawana (The Ark) and Ferdinand Cheval (Le Palais Ideal). I've also got a symphonic piece about Hopi culture, a piano duet on Defoe's Robinson Crusoe and so on. Learning about painting, and art in general, critical theory, philosophy etc. I saw as being integral to my Ph.D. studies. I did a lot of reading back then. I had lofty ideas that the polymath model was the way forward, and if I'm honest, I still believe this to be the case. mwe3: One writer wrote that Next Stop is the best album Allan Holdsworth never made. (or something to that effect) It sounds to me though, like you take Holdsworths sound and make it even more melodic from a rock perspective. Is that a fair assessment? John Irvine: Holdsworth is a big influence, yes. But, as I've said in other interviews, not in terms of his soloing. It's a pointless exercise even bothering to cop licks off him. His solo ideas work with his chordal context, and there it ends. And anyway, he is so technically unapproachable to most mortals like myself that imitation is not even an option. I think because my album covers have headless guitars on them, and I mention him as an influence in press material, a lot of people have commented on the perceived similarities. So it's largely my fault. I personally think my music doesn't resemble Holdsworths at all. It is much more rock-based and Metheny-esque than Holdsworthian. Having said that, the above quote is still my favorite! 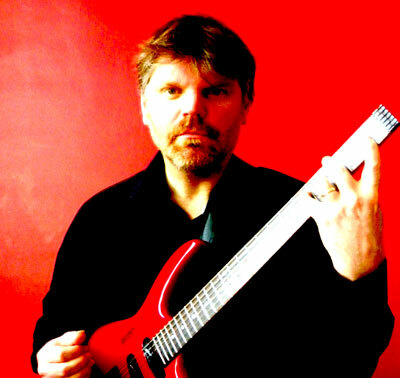 mwe3: What guitarists today do you feel are breaking new ground for the instrumental rock fusion genre? he's not new, but he only recently recorded his two solo albums, though I don't hear a lot of stuff that excites me as much as the older albums by the greats. You see, people like Metheny, Holdsworth - these guys are great composers, and the difference between them and the you-tube speed merchants is just that - the compositions. I mean, wouldn't you rather listen to Metheny's The First Circle or Minuano (Six-Eight) than a sweep-picking, neo-classical nightmare? 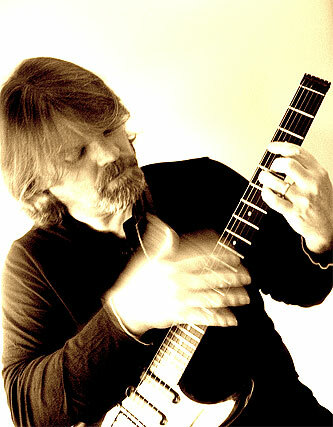 Wouldn't you rather hear a piece like Holdworth's Sphere Of Innocence over any shredding-type music you care to mention? There is no contest, in my opinion. But bigger, stronger, faster, louder seems to win more and more in our culture, doesn't it? A shame that. mwe3: Any favorite current artists that youre listening to these days? John Irvine: As far as current jazz musicians go, I like the saxophonist David Binney a lot, and I also find myself turning to some of the fusion that I missed out on first time around: Oregon, Codona, Brand X etc... I get a kick out of finding new things I've missed in the past. You used to be such a victim of what your local record store would stock, but that's all changed now. The internet is a great source of discovery in that way. With rock bands, I'm very into noise and math rock: Rob Crow, Amusement Parks On Fire, Buildings, Ladder Devils, Cellos, Kowloon Walled City, Dope Body, Polvo, Pissed Jeans, Roomrunner - this kind of stuff. It's where it's at as far as inventiveness is concerned, at the moment. mwe3: Do you enjoy playing live in concert? Tell us about what your live shows are like? mwe3: What other activities are you involved with in Scotland, including your classical music and TV/Film music and are you also into the literary world too as I saw on your www.johnirvinewriter.com web site. John Irvine: As far as other activities go, my classical composition is on hold for the moment. Similarly with TV, film and theater music. My kids are still young and my son is a Type 1 Diabetic so I have to prioritize my creative work carefully nowadays. But, yes, I have two books out, and a lot of published poetry in various journals and webzines. The novels are part of a nerdy, sc-if trilogy called The Smith Chronicles and have been selling very well, to my surprise. I'm finishing the final novel at the moment for late 2015 publication. After that I will return to writing poetry for a bit and then I have plans to start a new fantasy/historical book for children based on the Scandinavian to Constantinople trade route during the Middle Ages. I'm really looking forward to that. mwe3: Even though Next Stop came out in 2013, it clearly deserves hearing by guitar fans in 2015. So a year after Next Stop, have you been writing new music and or planning new recordings? John Irvine: As far as another JIB album goes, I don't think that will happen this year. I've simply haven't got the time. But the next one will be very different to the previous albums, that is for sure.